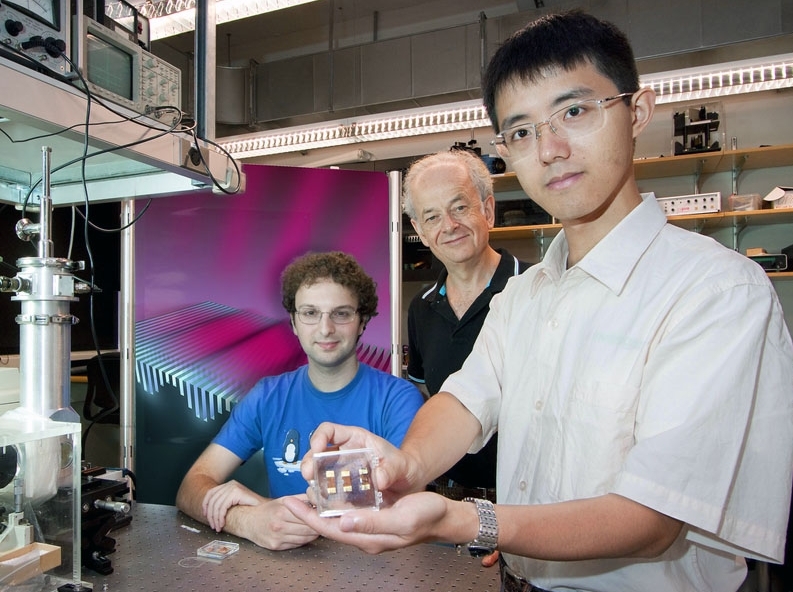 Scientists from Harvard University and the University of Leeds recently demonstrated a new terahertz semiconductor laser capable of emitting beams with a much smaller divergence than conventional terahertz laser sources. The collaborative study suggests several future applications, all relying on the improved terahertz laser rays. In physics, terahertz radiation refers to electromagnetic waves sent at frequencies in the terahertz (THz) range. The term is normally used for the region of the electromagnetic spectrum between 300 gigahertz (3×1011 Hz) and 3 terahertz (3×1012 Hz), corresponding to the submillimeter wavelength range between 1 millimeter (high-frequency edge of the microwave band) and 100 micrometer (long-wavelength edge of far-infrared light). Terahertz rays (T-rays) can penetrate efficiently through most materials available, such as clothing and plastic; thus, they are ideal for detecting concealed weapons and biological agents, imaging tumors without harmful side effects, and spotting defects within materials. However, most semiconductors used today lack the precision needed for such sensitive tasks. “Unfortunately, present THz semiconductor lasers are not suitable for many of these applications because their beam is widely divergent – similar to how light is emitted from a lamp,” explains Professor Federico Capasso, of Harvard. He was part of the team that conducted the study – published in Nature Materials – alongside Nanfang Yu and Vinton Hayes, also from Harvard School of Engineering and Applied Sciences. The team was led by Edmund Linfield from the School of Electronic and Electrical Engineering, University of Leeds. To get around the conventional limitations, the researchers sculpted an array of sub-wavelength-wide grooves, dubbed a “metamaterial”, directly on the facet of quantum cascade lasers. “By creating an artificial optical structure on the facet of the laser, we were able to generate highly collimated (i.e., tightly bound) rays from the device," said Capasso. The devices emit at a frequency of 3 THz (or a wavelength of one hundred microns), in the invisible part of the spectrum known as the far-infrared. "This leads to the efficient collection and high concentration of power without the need for conventional, expensive, and bulky lenses,” he explains. Although this research has yet to provide a fully-operational solution to the issues THz rays face, it received one major acknowledgment: Its funding was partially provided by the Air Force Office of Scientific Research and by the Center for Nanoscale Systems (CNS) at Harvard University. TFOT has also covered the T-Ray Scanner designed by scientists at the U.S. Department of Energy’s Argonne National Laboratory to be deployed in airports and detect weapons, and the camera that ‘sees’ under clothes developed by the U.K. Company ThruVision. Another related TFOT story is “Saser”, a new type of acoustic laser device which is capable of producing an intense beam of uniform sound waves on a nano scale. For more information about the demonstration of THz rays, see Harvard’s official press release.